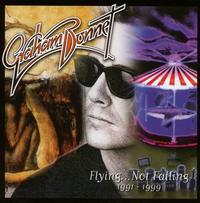 This new three-disc set from Graham Bonnet is pretty darned good. I've included it under metal because two of the three discs here fit there. I would say that the first two albums here are among Bonnet's best music. Each disc gets some bonus material. For the first two it comes in the form of live performances that were previously unreleased. I think they were all originally bootleg recordings, but they are pretty good quality nonetheless. The final disc includes some instrumental demos. This has a nice booklet, and each disc comes in a sleeve with the original album art. Let's look at the individual albums here. The Day I Went Mad makes me think of Ozzy quite a bit. It features a lot of notable musicians including Bruce Kulick, Tim Bogert, Tony Franklin, Slash and Vivian Campbell. Underground seems more adventurous. The sound takes more chances while still maintaining a metal edge. It is arguably one of Bonnet's best releases. Tony Franklin appears on that set, too. The oddity here is Here Comes the Night. While the other two albums focus on the metal end of things, that disc is made up of soulful, R&B styled music mostly. It is a covers oriented album. Personally, I think it's the weakest part of the set. Then again, a lot of that is the fact that I'm not a big fan of that kind of music. One of point of interest on the set is the fact that Don Airey guests on the release. The album has its moments, but I think it's best to think of it as a bonus rather than a main component of this set. When you look at the whole box set, this release is well worth having. Keyboards start this. As the guitar joins, though, we're brought out into a cool jam that's very much a 1990s metal styled piece. The bridge brings more of a melodic rock sound to the piece. There is a mellower instrumental bit further down that road that takes it toward prog rock. The jam that follows moves it into technical, neo-classical metal. Coming in mellower, this grows out as sort of a power-ballad. The screaming hot metal movement really rocks. This a melodic styled metal cut. It has a real 1990s sound. That said, it still feels relevant. It has some meaty riffs and a cool tone to it. I don't think this one is really a metal tune at all. It's more a cool hard rocking piece. Slash provides guitar on this tune. It's a fun one and a nice change of pace. Metal with some progressive rock elements creates the basis for this killer tune. It's another that serves up a nice slab of variety while still creating an effective musical excursion. More of a power-ballad, I'm not crazy about this tune. It has a tasty and expressive guitar solo, though. A killer rocker, this has a lot of that 90s metal texture built into it. It's a raunch and roll kind of song. Scorching hot hard rock and metal merge on this number. It's furious and quite meaty. A bit of a percussion showcase starts this. It works out from there to a jam that has a lot of progressive rock in the mix, but with a metal edge. It drops to a percussion based segment for the processed vocals. Melodic hard rock with a metal edge, this is classy stuff for sure. This gets quite soaring as it evolves later. The closing tune is a cover of a Beatles track. I don't know about the wisdom of this. I mean, yeah, it's a solid rendition, but it doesn't seem to fit with the rest of the set. It's also kind of a let-down as the closing cut of the album proper. Still, they bring some powerhouse hard rocking sound into it later. Recorded live at Easington Rock Garden in November of 2001, This two-fer starts with another Beatles rocker. The sound quality isn't great, but I've heard worse. The second half is a Little Richard stomper. There is some killer guitar soloing on this number, and it has a lot of energy and charm. Recorded at Coconut Teaser on September 23rd, 2000, this feels very much like a psychedelic rocker as it comes in here. The sound quality on this recording is similar to that of the previous tune. I dig the hard rocking metallic edge on the later parts of this tune in this live telling. This literally becomes a screamer. The instrumental section brings some more psychedelia to the table. The final four songs (starting with this one) were recorded in Culver City in May of 2000. I think the recording quality here is a bit better. This comes across as a real screamer in this live telling. They put in a solid live version of this tune. A song Bonnet has been doing since his Rainbow days, this is a cool live take of the tune. There is a parental advisory applied to the stage banter after this cut. The closing bonus cut is the Beatles cover that closed the album proper. I wasn't blown away by the studio take on this. This live recording doesn't really do much to improve my opinion. I should mention that I'm not a big fan of the early Beatles stuff. All that said, they do bring some literally screaming energy to this later. A meaty metal mode opens this cut. It has such a cool riff driving it. Mix Guns 'N' Roses with Ozzy Osbourne and you might have something close to this. The powerhouse instrumental movement that comes in later in the track really sends it over the top in a good way. There is still quite a bit of that G'N'R sound in the mix here. It's very meaty and quite hot. As good as the opener was, I think I like this even more. I like the cool little organ bit late in the track. This starts with some real bluesy stuff and works out to another smoking hot metal stomper. Starting with a mellower movement, this evolves into more of the hard rocking metallic stuff from there after a time. This is a catchy cut in a lot of ways, but there is a bit of a left-of-center edge to it in some ways. A balladic cut, this is very classy. It has some progressive rock and psychedelic elements at play, but the slide guitar lends some down-home blues and even some country music to it. I suppose this is folk rock more than it is anything else. That said, it's a great tune that lends some variety, while just being a great tune. More of a melodic metal cut, this makes me think of what you might get if you merged Deep Purple with Guns 'N Roses. It's a cool rocker. There is a real psychedelic rock edge to first part of this. It's kind of a trippy segment. I guess "strange" is a good description. It's also quite compelling, though. It turns out to more of a metal stomper after the first vocal movement, though. There are times later where Bonnet's vocals make me think of Bruce Dickinson. This really does become a stomper, but has a really dynamic and diverse arrangement. This also has a lot of psychedelia built into it. It's a cool, dreamy, floating kind of number. It doesn't turn metallic at all. It reminds me in some ways of the mellower side of Led Zeppelin. We're back into the furious metal zone here. This is a scorching hot stomper. It gets quite raw, but in a good way before it ends. Like he did on the first CD of this set, Bonnet ends this album with a cover - this time of Jimi Hendrix. I've always said that you should make a song your own if you are going to cover it. Well, Bonnet and company take that to heart here. This is a unique mellow rock take on the cut. It has a modern sound with the familiar melodies and lyrics. This Alcatrazz song gets a solid live rendition here. I really like the guitar solo. The chorus hooks work really well, too. I have hunch that there are a lot of people who don't realize that "Since You Been Gone" was written by Russ Ballard, assuming that it was either an original for Head East or Rainbow. Here's another tune that was penned by Ballard. Coming in with a keyboard introduction, this works out to a straight-ahead rocker. There are parts of this that really sound a bit like "Since You Been Gone" to me. I love the guitar solo. The audience sounds get pretty loud before and during this track. That's the first point where I realized that this was an audience recording. This time around Bonnet and company turn their attention to a song penned by the Bee Gees. It was not a Bee Gees song, though, but rather recorded by The Marbles (Bonnet was one half of The Marbles). I like this alright, but it's not a highlight of the set. We're back into Alcatrazz territory with this song. It is a fast paced and smoking hot live rendition of the tune. I think I might like this better than the original version. With a bit of The Beatles in the between song banter, this cut comes out after a bit. It's a solid rocker, but not one of the highlights of the show. The audience noise gets pretty annoying on this number. Here's a cut that reaches back to Bonnet's time with Rainbow. This is an anthemic AOR based rocker. It works pretty well here. Another AOR rocker, this is good, but not really any kind of standout. I do like the guitar solo a lot. This makes me think of Elton John's "Philadelphia Freedom" in some ways. This has a soulful pop rocker. It's fun, but a big change from the other two albums. Old school R&B sounds are the idea here. This is a mellow cut that feels very much old school. I really don't like this one. It's just not my kind of thing. The saxophone soloing is pretty tasty, though. This has a lot of a Motown kind of sound to it, but this works better. It has more energy. It feels a bit more AOR oriented. Bonnet's performance gets pretty impassioned at times. A studio take on the Bee Gees penned Marbles song we heard live on the last CD, this is slow moving and fairly effective. It's slow moving, but has a lot of emotion packed into it. This has a lot of 80s music sound to it. It's solid, but not really a highlight. Here we get a cover of a Sam Cooke song. This really works better than most of the rest on this CD. The soulful vibe is compelling. I dig the keyboard solo, too. We're in James Brown territory here. This rendition is pretty cool. It has a similar sound to the rest of this CD, but the energy and power really shines here. Again, the keyboards stand tall on this arrangement. I love the saxophone on this cut, too. This song was originally done by The Kinks. Rather than sounding like that act, this has a rather jazzy vibe merged with the electronic styled music of the 80s. Bonnet's performance gets quite powerful at times. The sax brings a lot of magic to the mix, too. Adult contemporary music, jazz and more merge on this. It reminds me of some of the blue-eyed soul for which Michael McDonald is known. This was a song from the original Moody Blues, penned by Denny Laine when he was still in the band. The sound here is kind of cool. This is more of a modern rocker than a lot of the music here. In fact, this is one of my favorites. It's still well set in a pop rock kind of vibe, but it's a bit less mainstream somehow. It has some meat on its bones. A song originally recorded by Elvis Presley, this has a lot of old school country in the mix. It's a slow moving number that really feels like a modern take on that kind of old-fashioned sound. While it brings some variety, it's not really one of my favorites here. Now, this is more like it. This is the one cut that feels like it fits with the first two albums. Sure, it still has some of the mainstream pop rock elements. Overall, though, this one is really harder-edged and more modern. This instrumental version is a solid mainstream sounding tune. It's probably best described as "pop music based." That said, it is mellow rock at its core. A metal guitar opens this. As the instrumental cut works out it feels a lot like Dire Straits to me. I like this one quite a bit. This has a real bouncy 80s music kind of vibe to it. While I liked the version of this we heard earlier quite a bit, this doesn't really do it justice. Then again, it's a demo. It has its moments, particularly in terms of the guitar soloing.